Sometimes it becomes necessary for an owner to re-home a pet. Regardless of the reason, the animal shelter should be a last resort for a pet. Despite our best efforts to provide for the pets in our care, pets have a better life when they are in a home. If you can no longer keep your pet, please consider the following options and start early in order to avoid surrendering your pet to the shelter. 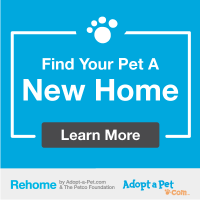 GetYourPet.com - is another web based company that matches guardians of dogs and cats who need a new home with potential adopters. Your pet will be seen along with pets offered for adoption by local shelters and rescues. Your contact information is kept private. You can communicate with potential adopters and will take comfort in knowing the outcome for your pet. A closed Facebook group dedicated to improving the lives of pets in Colleton. You must request to join the group and be approved prior to posting. Pet owners are often surprised to find out that someone in their own personal circle will welcome their pet into their family. Be sure to check with family and friends, use social media and bulletin boards at vet offices, work and other high traffic locations to advertise your pet. Great photos make a huge difference and video is a big plus.